Frame rate is capped at 30 FPS, cutscenes at 15 FPS. See High frame rate. Only supports DirectInput for controllers, with no true analog support. Some of the hauntings from the console version are missing. Correct the UI/ HUD width in widescreen. Enabling this option disables shader effects. A fix which adds new features and fixes some bugs. Configure the width and height and other options in Silent_Hill_4_PC_Fix.ini. Start the game with DLLInjector.exe. Silent Hill 4 in widescreen HD. Use Silent Hill 4: Wrapper by Nemesis or Silent Hill 4 Widescreen Fix. Forcing through GPU driver can cause visual glitches. It is highly recommended to adjust the default brightness and contrast. Brightness = 4, Contrast = 8, all gamma 1.0 looks fine. It is highly recommended to set on realtime shadows in the game settings. Set the name and executable path. Click on Input tab, set Cursor Clipper to On. 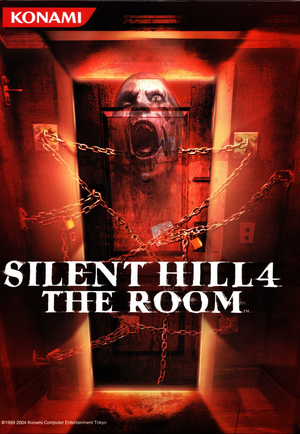 Download Silent Hill 4 Wrapper by Nemesis. Copy Nemesis 60FPS contents to the installation folder. Causes Henry to be unable to move in attack stance. Cannot finish the game because of a game breaking bug during the final boss. Install Silent Hill 4: Wrapper by Nemesis. Edit sh4w.ini and change all blur values from -1.0 to 0.0. Put the D3D8to9 DLL by crosire in the game folder. DirectInput only. No true analog support. Default bindings are awkward. Controls should be adjusted. For XInput controllers see Force feedback driver for XInput. A fix is required for the game to properly recognize XInput triggers and right analog stick when assigning controls. XInput Plus replaces the dinput8.dll included in the Wrapper by Nemesis. Only available in the European version. Shadows looks poor in many cutscenes and the player may want to disable them in the options. On some systems, even though you meet the requirements to play the game it won't run. Open the folder where the game is installed. Rename CheckSpec.dll to something else or delete the file. This page was last edited on 14 April 2019, at 03:47.